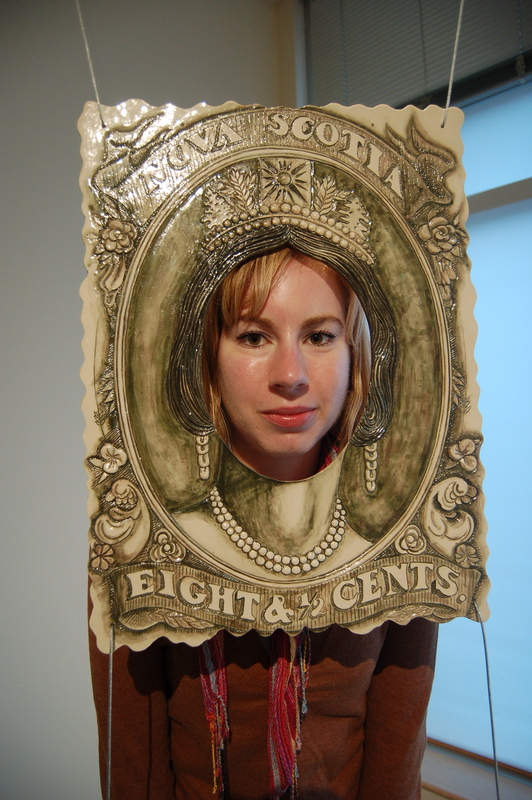 At a 2010 artist-in-residency at the Nova Scotia Centre for Craft and Design, I re-created and enlarged an 1862 issue stamp of a cameo etching of the Queen Victoria, removing her face from the original design. During the exhibition, people were encouraged to place their heads inside the work and photograph themselves as the Queen. This work was intended as an old fashioned souvenir relating to modern identity construction and the personal mythologies of a current generation, where avatars and plastic identities are the norm. The literal removal of a head of state questions the relevance of the distant monarch and suggests a personalised replacement, which may be equally as fraught.